Professor Hans Beger MD FACS is Chairman and Head of the Department of Surgery, University of Ulm, Germany. He has published 675 papers and has served as an Editorial Board Member for 28 international surgery journals. He has also edited 21 books and delivered more than 250 international lectures. He also developed a surgical procedure for removing the head of the pancreas while preserving the duodenum: known as Beger's operation. Professor Andrew L. Warshaw MD FACS is the W. Gerald Austen Professor of Surgery, surgeon-in-chief and chairman of the Department of Surgery at Massachusetts General Hospital. He has made important contributions to the diagnosis and treatment of pancreatic cancer and the pathogenesis and management of pancreatitis. A distinguished teacher, editor and prolific writer, he is Editor-in-chief of the journal Surgery. He has served on the editorial boards of 15 other major journals and as visiting professor at more than 50 major universities in the U.S. and around the world. He serves as a governor of the American College of Surgeons, and president-elect of the Halsted Society. He is past-president of the Society of Surgery of the Alimentary Tract and International Association of Pancreatology. Professor David Whitcomb MD PhD, is Professor of Medicine, Cell Biology & Physiology, and Human Genetics, and Chief, Division of Gastroenterology, Hepatology and Nutrition, University of Pittsburgh, PA, USA (Pancreatologist). He founded and directs the Center for Genomic Sciences beginning in 1995. He has received numerous awards, including election to the prestigious American Society for Clinical Investigation ("Young Turk"). He conducts basic and translational research with a focus on pancreatic diseases. His laboratory group discovered the gene causing hereditary pancreatitis and other causes of pancreatic disease. In addition, he leads several research projects on alcoholic pancreatitis and pancreatic physiology. He has published over 100 manuscripts and recently co-edited two books on inherited diseases of the pancreas. He is a Counselor for the American Gastroenterology Association (AGA), the American Pancreas Association and the International Association of Pancreatology, and is Chairman of the Pancreatic Disorders Section of the AGA. He is an Associate Editor for Pancreas, Digestive Diseases and Sciences, and Pancreatology. He co-founded the Midwest Multicenter Pancreatic Study Group and serves on national and international committees for the major gastroenterology and pancreatic societies. He has just been elected President of the American Pancreas Association. Professor Richard Kozarek, Chief of Gastroenterology, Virginia Mason Medical Center, and Clinical Professor of Medicine, University of Washington, Seattle, Washington. 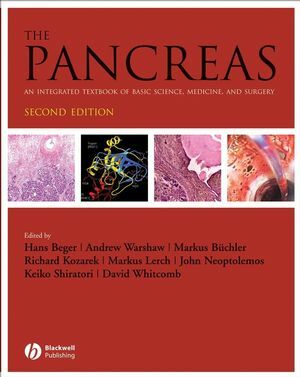 1 Definitions of pancreatic diseases and their complications: David C. Whitcomb (University of Pittsburgh) and Hans G. Beger (University of Ulm, Germany). Section I: Anatomy of the pancreas:. 2 The history of the pancreas: Irvin M. Modlin (Yale University School of Medicine), Manish C. Champaneria, Anthony K.C. Chan, Mark Kidd (Yale University School of Medicine), and Geeta N. Eick. 3 Development of the pancreas and related structures: Brian Lewis (University of Massachusetts Medical School). 4 Anatomy and fine structure: Dale E. Bockman (Medical College of Georgia). 5 Congenital and inherited anomalies: Martin Zenker (University of Erlangen-Nuremberg) and Markus M. Lerch (Ernst-Moritz-Arndt University, Germany). Section II: Physiology of pancreatic functions:. 6 Physiology of acinar cell secretion: Ole H. Petersen (University of Liverpool). 7 Physiology of duct cell secretion: Min Goo Lee (Yonsei University College of Medicine, Korea) and Shmuel Muallem (University of Texas Southwestern Medical Center). 8 Physiology of experimental pancreatitis: Ashok K. Saluja (University of Minnesota), Vijay P. Singh (Mayo Clinic College of Medicine), and Phoebe Phillips (Mayo Clinic College of Medicine). 9 Physiology of sphincter of Oddi function: James Toouli (Flinders University, Australia). 10 Neurohormonal and hormonal control of exocrine pancreatic secretion: Chung Owyang (A. Alfred Taubman Health Care Center, USA). 11 Regulation of pancreatic protein synthesis and growth: Maria Dolors Sans (University of Michigan Medical School), Stephen J. Crozier (University of Michigan), and John A. Williams (University of Michigan Medical School). 12 Insulo-acinar relationship: Keiko Shiratori (Tokyo Women’s Medical University School of Medicine) and Kyoko Shimizu (Tokyo Women’s Medical University School of Medicine). 13 Etiopathogenesis and epidemiology of alcohol-induced acute pancreatitis: Minoti V. Apte (University of New South Wales), Ron C. Pirola, and Jeremy S. Wilson (University of New South Wales). 14 Etiology and epidemiology of biliary acute pancreatitis: Michael G.T. Raraty (University of Liverpool) and John P. Neoptolemos (University of Liverpool). 15 Acute pancreatitis associated with congenital anomalies: Tracy C. Grikscheit (USC Keck School of Medicine, Los Angeles) and Andrew L. Warshaw (Harvard Medical School). 16 Acute pancreatitis associated with metabolic,infectious, and drug-related diseases: Stefan Turi (Ernst-Moritz-Arndt University, Germany), Matthias Kraft, and Markus M. Lerch (Ernst-Moritz-Arndt University, Germany). 17 Acute pancreatitis in children: Mark E. Lowe (Children’s Hospital of Pittsburgh at University of Pittsburgh Medical Center) and Véronique D. Morinville (Montreal Children’s Hospital). 18 Understanding of acute pancreatitis from animal experiments: Thomas Foitzik (University of Rostock). 19 Genetic factors in acute pancreatitis: David C. Whitcomb (University of Pittsburgh) and Georgios I. Papachristou (University of Pittsburgh). 20 Histopathology of acute pancreatitis: Günter Klöppel (University of Kiel). 21 Molecular, biochemical, and metabolic abnormalities of acute pancreatitis: Julia Mayerle (Ernst-Moritz-Arndt University, Germany), F. Ulrich Weiss, Walter Halangk (Otto-von-Guericke University, Germany), and Markus M. Lerch (Ernst-Moritz-Arndt University, Germany). 22 Clinical course of alcoholic acute pancreatitis: Roland H. Pfützer and Manfred V. Singer (University Hospital of Mannheim, Germany). 23 Clinical course and treatment principles of biliary acute pancreatitis: Julia Mayerle (Ernst-Moritz-Arndt University, Germany), Ashok K. Saluja (University of Minnesota), and Markus M. Lerch (Ernst-Moritz-Arndt University, Germany). 24 Clinical assessment and biochemical markers to objectify severity and prognosis: Bettina M. Rau (University of Rostock, Germany). 25 Imaging acute edematous–interstitial and necrotizing pancreatitis: Patrick C. Freeny (University of Washington School of Medicine). 26 Treatment of acute pancreatitis:. Conservative therapy of acute pancreatitis: Paul Georg Lankisch (Municipal Clinic of Lüneburg, Germany). ICU treatment of severe acute pancreatitis: Mark Topazian (Mayo Clinic College of Medicine, USA) and Henry J. Schiller (Mayo Clinic College of Medicine, USA). 27 Bacterial and fungal infections in necrotizing pancreatitis: pathogenesis, prevention, and treatment: Bettina M. Rau (University of Rostock, Germany) and Hans G. Beger (University of Ulm, Germany). 28 Indications for interventional and surgical treatment of acute pancreatitis: Thomas E. Clancy (Harvard Medical School) and Stanley W. Ashley (Harvard Medical School). 29 Surgical management of necrotizing pancreatitis:. Débridement and continuous closed lavage: Bettina M. Rau (University of Rostock, Germany) and Hans G. Beger (University of Ulm, Germany). Débridement and open packing/staged laparotomy: Raymond Aerts (Catholic University, Belgium) and Freddy M. Penninckx (Catholic University, Belgium). Débridement and closed packing: J. Rubén Rodríguez (Massachusetts General Hospital), Carlos Fernández-del Castillo (Hospital Clinic I Provincial de Barcelona), and Andrew L. Warshaw (Harvard Medical School). 30 Strategies for surgical treatment of pseudocysts after acute pancreatitis: Antonio Ramos-De la Medina (Mayo Clinic College of Medicine, USA), Kaye M. Reid-Lombardo (Mayo Clinic College of Medicine, USA), and Michael G. Sarr (Mayo Clinic College of Medicine, USA). 31 Endoscopic treatment of necrotizing pancreatitis: Stefan Seewald (University Medical Center Hamburg-Eppendorf, Hamburg), Salem Omar, and Nib Soehendra (University Medical Center Hamburg-Eppendorf, Hamburg). 32 Minimal-access surgical treatment of necrotizing pancreatitis and pancreatic abscess: Saxon Connor (Christchurch Hospital,New Zealand), Michael G.T. Raraty (University of Liverpool), Jonathon Evans (University of Liverpool), and John P. Neoptolemos (University of Liverpool). 33 Management of fluid collections in acute pancreatitis: Gregory Stringfellow (St. Joseph’s Hospital and Medical Center, Pheonix), Eric Vansonnenberg (St. Joseph’s Hospital and Medical Center, Pheonix), Giovanna Casola, Gerhard R. Wittich, Sridhar Shankar,and Ray Shamos (St. Joseph’s Hospital and Medical Center, Pheonix). 34 Management of pancreatic fistula in acute pancreatitis: Jens Werner (University of Heidelberg, Germany) and Markus W. Büchler (University of Heidelberg, Germany). 35 Enteral nutrition and parenteral nutrition: Keiko Shiratori (Tokyo Women’s Medical University School of Medicine). 36 Long-term outcome after acute pancreatitis: Werner Hartwig (University of Heidelberg, Germany), Jens Werner (University of Heidelberg, Germany), and Markus W. Büchler (University of Heidelberg, Germany). 37 Chronic pancreatitis: consequences of recurrent acute episodes: Günter Klöppel (University of Kiel, Germany). 38 Fibrogenesis of the pancreas: the role of stellate cells: Max G. Bachem (University Hospital Ulm, Germany), Shaoxia Zhou, Wilhelm Schneiderhan,and Marco Siech (Community Hospital Aelen, Ulm, Germany). 39 Epidemiology and pathophysiology of alcoholic chronic pancreatitis: Stephen J. Pandol (VA Greater Los Angeles Health Care System), Aurelia Lugea, Anna S. Gukovskaya (VA Greater Los Angeles Health Care System), and Ilya Gukovsky (VA Greater Los Angeles Health Care System). 40 Hereditary chronic pancreatitis: David C. Whitcomb (University of Pittsburgh). 41 Epidemiology and pathogenesis of tropical chronic pancreatitis: Rakesh K. Tandon (Pushpawati Singhania Research Institute for Liver, Renal and Digestive Diseases, India). 42 Autoimmune pancreatitis: Kazuichi Okazaki (Kansai Medical University, Japan). 43 Cystic fibrosis-associated pancreatitis: David C. Whitcomb (University of Pittsburgh). 44 Chronic pancreatitis: a risk factor for cancer? : Albert B. Lowenfels (New York Medical College) and Patrick Maisonneuve (European Institute of Oncology, Italy). 45 Molecular understanding of chronic pancreatitis: David C. Whitcomb (University of Pittsburgh). 46 Pain mechanisms in chronic pancreatitis: Fabio F. di Mola and Pierluigi di Sebastiano (IRCCS Casa Sollievo Della Sofferenza, Italy). 47 Clinical and laboratory diagnosis of chronic pancreatitis: Julia Mayerle (Ernst-Moritz-Arndt University, Germany), Peter Simon , and Markus M. Lerch (Ernst-Moritz-Arndt University, Germany). 48 Contrast-enhanced computed tomography and magnetic resonance imaging: Hans-Jürgen Brambs (University Hospital, Germany). 49 Endoscopic retrograde cholangiopancreatography, magnetic resonance cholangiopancreatography, and endoscopic ultrasound in chronic pancreatitis: Andrew S. Ross (University of Chicago) and Irving Waxman (University of Chicago). 50 Natural course of chronic pancreatitis: Paul Georg Lankisch (Municipal Clinic of Lüneburg, Germany). 51 Treatment of pseudocysts in chronic pancreatitis: Syed A. Ahmad (University of Cincinnati) and Jeffrey B. Matthews (University of Cincinnati). 52 Medical treatment of chronic pancreatitis:. Pain management: Joachim Mössner (University of Leipzig). Enzyme treatment: Peter Layer (Israelitic Hospital, Germany) and Jutta Keller. Nutritional support: Daniel K. Mullady (University of Pittsburgh Medical School) and Stephen J.D. Oí’Keefe (University of Pittsburgh). Antioxidants: Nathan Howes (Royal Liverpool University Hospital), William Greenhalf (University of Liverpool), and Michael G.T. Raraty (University of Liverpool). 53 Endoscopic and interventional therapy of chronic pancreatitis: Richard A. Kozarek (Virginia Mason Medical Center, Seattle). 54 Strategies for surgical treatment of chronic pancreatitis:. Indications for and goals of surgical treatment: Hans G. Beger (University of Ulm, Germany), Frank Gaunsauge, Michael Schwarz, and Bertram Poch (Donauklinik, Neu-Ulm,Germany). Pancreatic duct drainage procedures: Oscar J. Hines (David Geffen School of Medicine at UCLA, Los Angeles) and Howard A. Reber (University of California at Los Angeles School of Medicine). Duodenum-preserving pancreatic head resection in inflammatory and cystic neoplastic lesions of the pancreas: Hans G. Beger (University of Ulm, Germany), Bettina M. Rau (University of Rostock, Germany), and Bertram Poch (Donauklinik, Neu-Ulm, Germany). Major pancreatic resections: Kaye M. Reid-Lombardo (Mayo Clinic College of Medicine, Rochester, USA), Michael B. Farnell (Mayo Clinic College of Medicine, Rochester, USA), and Michael G. Sarr (Mayo Clinic College of Medicine, Rochester, USA). Nerve ablation techniques in chronic pancreatitis: Colin J. McKay (Glasgow Royal Infirmary) and Peter Wysocki. 55 Chronic pancreatitis: late outcome after medical and surgical treatment: Hans G. Beger (University of Ulm, Germany) and Bertram Poch (Donauklinik, Neu-Ulm,Germany). 56 Management of pancreatic diabetes secondary to chronic pancreatitis: Keiko Shiratori (Tokyo Women’s Medical University School of Medicine). Section V: Neoplastic lesions of exocrine tissue: pancreatic cancer. 57 Epidemiology of pancreatic cancer: Nicholas Alexakis, Paula Ghaneh (University of Liverpool), and John P. Neoptolemos (University of Liverpool). 58 Molecular biological understanding of development of pancreatic cancer: Eithne Costello (Royal Liverpool University Hospital). 59 Familial pancreatic cancer: William Greenhalf (University of Liverpool), Louis J. Vitone, and John P. Neoptolemos (University of Liverpool). 60 Pathology of exocrine pancreatic tumors: Günter Klöppel (University of Kiel), Bence Sipos, and David S. Klimstra (Memorial Sloan-Kettering Cancer Center, New York). 61 Precancerous lesions: Roland M. Schmid (Technical University Munich). 62 Role of endoscopic ultrasound for diagnosis and differential diagnosis of neoplastic lesions: Drew Schembre (Virginia Mason Medical Center, Seattle). 63 Radiologic diagnosis of pancreatic cancer: computed tomography and magnetic resonance imaging: Enrique Lopez Hänninen (University Medical Center Berlin) and Roland Felix (University Medical Center Berlin). 64 Screening of hereditary pancreatic cancer families: Christopher Carlson (University of Washington Medical Center, Seattle), William Greenhalf (University of Liverpool), and Teresa A. Brentnall (University of Washington Medical Center, Seattle). 65 Clinical assessment and staging of pancreatic cancer: J. Ruben Rodriguez (Massachusetts General Hospital), Andrew L. Warshaw (Harvard Medical School), and Carlos Fernández-del Castillo (Massachusetts General Hospital). 66 Role of positron emission tomography in diagnosis of pancreatic cancer and cancer recurrence: Helmut Friess (Technical University Munich), Mert Erkan, Jörg Kleeff (Technical University Munich), Uwe Haberkorn, and Markus W. Büchler (University of Heidelberg). 67 Tumor markers in pancreatic malignancies: Fuyuhiko Motoi (Tohoku University School of Medicine, Japan), Shin-ichi Egawa, and Seiki Matsuno (Tohoku Koseinenkin Hospital, Japan). 68 The role of laparoscopy and peritoneal cytology in the management of pancreatic cancer: Kevin Conlon (Trinity College, Dublin) and Paul Balfe (St Luke’s Hospital, Kilkenny). 69 Pancreatic cancer staging systems and their clinical impact: Hans G. Beger (University of Ulm, Germany) and Dieter Birk (Krankenhaus Zweibrücken, Germany). 70 Endoscopic and interventional palliation of pancreatic cancer: Todd H. Baron (Mayo Clinic College of Medicine, Rochester, USA). 71 Pancreatic cancer: indications for resection: Akimasa Nakao (Nagoya University Graduate School of Medicine, Japan). 72 Pancreaticoduodenectomy for pancreatic cancer:. results after Kausch–Whipple and pylorus-preserving resection: Ramon E. Jimenez (University of Connecticut Medical School) and Andrew L. Warshaw (Harvard Medical School). 73 Extended radical surgery for pancreatic cancer: Jens Werner (University of Heidelberg) and Markus W. Büchler (University of Heidelberg). 74 Palliative pancreaticoduodenectomy: benefits and limitations: Helmut Friess (Technical University Munich), Jörg Kleeff (Technical University Munich), Mert Erkan, and Markus W. Büchler (University of Heidelberg). 75 Bypass surgery for advanced pancreatic cancer: Jürgen Weitz (University of Heidelberg), Peter Kienle, and Markus W. Büchler (University of Heidelberg). 76 Neoadjuvant treatment of pancreatic cancer:. borderline-resectable disease: Gauri Varadhachary (The University of Texas M.D. Anderson Cancer Center), Christopher H. Crane, Eric P. Tamm, Huamin Wang, Robert A. Wolff, and Douglas B. Evans (The University of Texas M.D. Anderson Cancer Center). 77 Adjuvant chemotherapy in pancreatic cancer: Paula Ghaneh (University of Liverpool) and John P. Neoptolemos (University of Liverpool). 78 Palliative chemotherapy for advanced pancreatic cancer: Yu Jo Chua (Royal Marsden Hospital) and David Cunningham (Royal Marsden Hospital). 79 Management of cancer pain: Sergio Pedrazzoli (University of Padua, Italy), Claudio Pasquali, Cosimo Sperti, and Francesca Avogaro (University Hospital of Padua, Italy). 80 Role of radiotherapy in the treatment of pancreatic cancer: Shilpen Patel (University of Washington Medical Center, Seattle), Michael C. Garofalo, and William F. Regine (University of Maryland). 81 Management of cancer recurrence: Helmut Friess (Technical University Munich), Jörg Kleeff (Technical University Munich), and Markus W. Büchler (University of Heidelberg). 82 Survival and late morbidity after resection of pancreatic cancer: Osamu Ishikawa (Osaka Medical Center for Cancer and Cardiovascular Diseases, Japan), Hiroaki Ohigashi, Hidetoshi Eguchi, Yo Sasaki, Terumasa Yamada, and Shingi Imaoka (Osaka Medical Center for Cancer and Cardiovascular Diseases, Japan). Section VI: Endocrine tumors of the pancreas:. 83 Diagnosis of endocrine tumors of the pancreas: Masayuki Imamura (Osaka Saiseikai Noe Hospital). 84 Islet cell tumors: Peter E. Goretzki (Department of Surgery, Insulinoma and GEP Center, Neuss-Düsseldorf, Germany) and Hans-Dietrich Röher (University of Düsseldorf, Germany). 85 Pancreatic endocrine tumors in multiple endocrine neoplasia syndrome: Elisabeth Spilcke-Liss (Ernst-Moritz-Arndt University, Germany), Peter Simon, Markus M. Lerch (Ernst-Moritz-Arndt University, Germany), and Henri Wallaschofski (Ernst-Moritz-Arndt University, Germany). 86 Nonfunctioning endocrine tumors: Hodaka Amano, Tadahiro Takada (Teikyo University School of Medicine, Tokyo), Fumihiko Miura, Takehide Asano, Masahiro Yoshida, Naoyuki Toyota, Keita Wada, Takahiro Isaka, Naoyuki Tamura, and Kenichiro Kato. 87 Surgical treatment of endocrine tumors: Masayuki Imamura (Osaka Saiseikai Noe Hospital, Japan). 88 Treatment of carcinoids of the pancreas and biliary tract: Andrea Frilling (University Hospital Essen, Germany) and Vito Cicinnati (University Hospital Essen, Germany). 89 Nonsurgical management of endocrine tumors: Rudolf Arnold (Philipps University, Germany) and Anja Rinke. 90 Liver transplantation in advanced disease of endocrine tumors: Christoph E. Broelsch (University Hospital Essen, Germany) and Andrea Frilling (University Hospital Essen, Germany). 91 Long-term outcome after treatment of endocrine tumors: Henning Dralle (University of Halle, Germany), Andreas Machens, Michael Brauckhoff, and Oliver Gimm (Martin-Luther University of Halle-Wittenburg, Germany). 92 Periampullary tumors: clinical presentation and diagnostic strategy: Amanda B. Cooper (Indiana University School of Medicine) and Keith D. Lillemoe (Indiana University School of Medicine). 93 Histology of cancer of the papilla, distal common bile duct, and duodenum: Hans-Peter Fischer (University of Bonn, Germany). 94 Adenoma and adenocarcinoma of the ampulla of Vater: diagnosis and management: William R. Brugge (Massachusetts General Hospital) and Andrew L. Warshaw (Harvard Medical School). 95 Endoscopic treatment of adenomas of the ampulla of Vater: benefits and limits: Richard A. Kozarek (Virginia Mason Medical Center, Seattle) and L. William Traverso (Virginia Mason Medical Center, Washington). 96 Surgical treatment of periampullary cancer: early and late results after resection: Hans G. Beger (University of Ulm, Germany), Bertram Poch (University of Rostock, Germany) Donauklinik, Neu-Ulm, Germany), and Bettina M. Rau (University of Rostock, Germany). Section VIII: Other tumors of the pancreas:. 97 Histology of cystic tumors of the pancreas: Wataru Kimura (Yamagata University School of Medicine, Japan). 98 Diagnostic imaging of cystic tumors: Masao Tanaka (Kyushu University, Japan), Kiichiro Kobayashi, Reiko Tanabe, and Koji Yamaguchi (Kyushu University, Japan). 99 Diagnosis and natural history of intraductal papillary mucinous neoplasms: L. William Traverso (Virginia Mason Medical Center, Seattle) and Richard A. Kozarek (Virginia Mason Medical Center, Seattle). 100 Mucinous cystic neoplasm: Suresh T. Chari (Mayo Clinic College of Medicine, Rochester, USA) and Thomas C. Smyrk (Mayo Clinic College of Medicine, Rochester, USA). 101 Surgical treatment and long-term outcome of cystic neoplasms of the pancreas: Carlos Fernández-del Castillo (Massachusetts General Hospital) and Andrew L. Warshaw (Harvard Medical School). 102 Minimally invasive and local ablation techniques of serous and mucinous cystic lesions: Laureano Fernández-Cruz (Hospital Clinic I Provincial de Barcelona). Section IV: Transplantation of the pancreas:. 103 Transplantation of pancreatic islets: Reinhard G. Bretzel (University Hospital Giessen and Marburg) and Mathias D. Brendel (University Hospital Giessen and Marburg).